Metronidazole is an antibiotic that is used in horses to treat bacterial infections caused by anaerobic bacteria (bacteria that do not live in the presence of oxygen). While it is very effective against most anaerobic bacteria, metronidazole has no activity against aerobic bacteria (bacteria that require oxygen). Many of the more serious infections in the horse, such as pleuritis, peritonitis, and abdominal abscesses, are caused by a mixture of aerobic and anaerobic bacteria. In these types of cases, metronidazole is given with other antibiotics that have activity against the aerobic bacteria. Metronidazole also is used to treat infections caused by an intestinal protozoal parasite called Giardia. 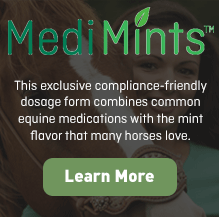 Like many other drugs in veterinary medicine, metronidazole is not FDA approved for use in animals and is not available from a veterinary pharmaceutical manufacturer; however, it may be compounded by a specialty pharmacy for your horse. Metronidazole is commonly used in horses to treat infections caused by anaerobic bacteria or protozoa, and is considered accepted practice within veterinary medicine. 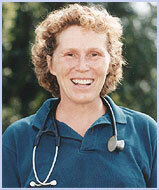 Give this medication to your horse exactly as your veterinarian prescribes. If you miss giving your horse a dose of metronidazole, give the next dose as soon as you remember or, if it is close to the next scheduled dose, return to the regular schedule. Do not double dose to catch up. Metronidazole is very bitter-tasting. Dosing can be difficult and many sick horses are not eating well enough to put pills in their feed. Compounding pharmacies can compound metronidazole in a variety of flavors and textures including pastes and suspensions that may be easier to use. Metronidazole also is absorbed rectally. In animals that are unable or unwilling to take this medication orally, your veterinarian may use a form of metronidazole that can be administered rectally. Although side effects are uncommon in the horse, the most common problems are associated with the drug’s bitter taste. It is important to find a reliable way to administer metronidazole that does not cause your horse to stop eating. High doses or long-term therapy with metronidazole, such as might be used in a particularly difficult bacterial infection, can cause problems with the central nervous system. Symptoms can include loss of coordination, staggering, disorientation, and even seizures. Metronidazole is metabolized by the liver. Animals with liver problems may be more at risk for side effects and are usually given a lower dose of metronidazole. Metronidazole should not be used in animals that may enter the food chain and it should not be used in animals that are known to be allergic to this drug. Metronidazole should not be used in pregnant animals, as it has been shown to cause birth defects in laboratory animals. Be sure to review with your veterinarian any medications or supplements your horse may be receiving. Metronidazole may increase clotting time in horses that are receiving an oral blood thinner, such as warfarin. Cimetidine can interfere with the liver’s ability to metabolize metronidazole. In this instance, the metronidazole dose may be reduced. If you suspect your horse or another animal was accidentally overdosed or has been given this medication inadvertently, contact your veterinarian or the A.S.P.C.A.’s Animal Poison Control Center at 888.426.4435. Always bring the prescription container with you when you take your animal for treatment. If you or someone else has accidentally eaten this medication, call the National Capital Poison Center at 800.222.1222. She began to develop her interest in client education and medical writing 1997. Recent publications include portions of The Pill Book Guide to Medication for Your Dog and Cat, and most recently Understanding Equine Medications published by the Bloodhorse. Wedgewood compounded veterinary preparations are not intended for use in food and food-producing animals.